First and foremost, if you own a rotary cleansing brush (this is a brush that spins in a circle) you're going to want to toss that into the trash right now! The problem with rotary brushes is that while they spin they pull your skin, breaking down the collagen and elastin leading to premature aging. Yikes! This is obviously the last thing we want to do while cleansing! So don't be lured by their cost effectiveness. These are fantastic brushes. I personally love the Smart Profile option because... you guessed it! It's a multitasker! With the ability to switch out different attachments, this cleansing device turns into a facial massager, a makeup brush and an at home pedicure enhancer. The only down side to the clarisonic is the brush heads themselves. Made from nylon bristles, these brush heads can actually cause little microscopic scrapes on the surface of your skin causing topical irritation. To combat this, I always suggest getting the Luxe Cashmere Brush Head. Great for all skin types, this brush gently yet effectively cleanses the skin without causing irritation. The biggest thing you need to keep in mind when using this device is cleanliness. These brush heads easily turn into cesspools of bacteria if not properly cared for. Replace your brush head EVERY 3 MONTHS! If all of that seems like a lot of work, try an anti-microbial silicone option. This is the first device of this kind I ever used. It's ultrasonic, meaning it vibrates - 8,000 pulses per minute to be exact. One charge will give you enough power to cleanse for an entire year. It too is a multitasker, cleansing on one side and offering anti-aging product penetration on the other. This is a great device. If I wasn't gifted the following cleansing gadget, I probably could have died happy. But now that I own a Qyk Sonic Zoe, I'm incredibly partial to its shape and design. Zoe has over 2,000 anti-microbial silicone touch points to effectively cleanse and massage the skin. The harder touch points on her opposite side, gently mimic a micro-needling treatment pushing product deep into the skin as it massages. I love the way this feels! 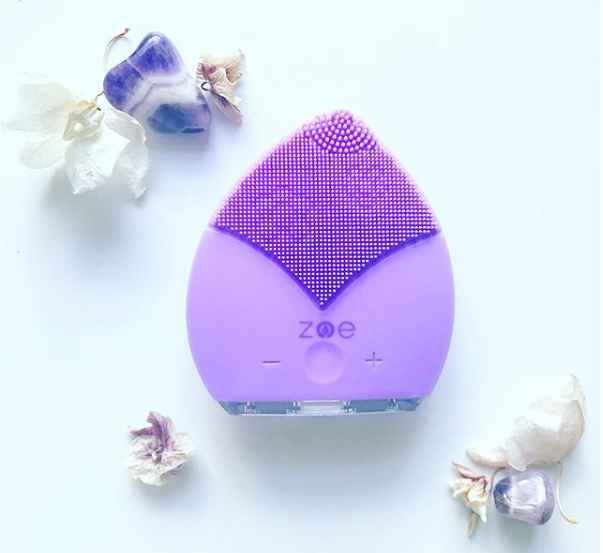 Zoe's petal design allows for cleansing all the hard to reach areas - between your brows, under your eyes, the sides of your nose and your upper lip. I believe it's this feature that really sets the Zoe apart from all other cleansing devices. Qyk Sonic gave me a discount code, 25% off plus free US shipping, making Zoe the cheapest full size cleansing device that I mentioned! So half way through writing this I realized I already did a cleansing device post. SORRY! I posted it last July which wouldn't be too repetitive if I was a more active blogger. I'm trying. I promise each Monday you'll be seeing emails from me in your inbox! Thank you for subscribing! See you next week! Oh! And if you feel so inclined, I'd love it if you'd SHARE THIS POST! Thanks again!